The new hen house arrived about an hour before I set off on my travels last Thursday. This allowed just enough time for me to help Mr Snail get it unpackaged and round the back of the house. The only construction required was attaching the laying boxes, sliding two doors into place, slotting in the perches and attaching the mesh run. Of course, the old run had to be dismantled and the old house moved out of the way. Mr Snail said he would do all this whilst I was away so that it would be fully installed by the time I returned home. And, thus, on Friday morning I was able to see a picture of the house in situ via Facebook and by Friday evening Mr Snail was able to report that the run was attached. There was a slight issue with attaching the drinker and feeder, but snipping a couple of pieces of wire allowed these to be attached and removed the need for a stand to support them. The girls spent their first night in the new house last Thursday – sleeping on the floor rather than on the perches, but that is their choice and not a problem – there is plenty of space. The house is lovely – there is a big door at the back to allow easy cleaning, two perches, an adjustable vent and two nest boxes. The pop-hole at the other end from the big door opens into a run with another pop-hole in the solid end of this through which they can exit into the garden. The run is about a metre long, so I wouldn’t want them to be confined in there all the time, but it will provide a secure space for them should we wish to leave them safely overnight at times when our neighbours are not available to put them to bed. The house is made of recycled agricultural plastic (old silage wrap, feed buckets, silage clamp covers, dumpy bags, fertiliser bags etc), so uses a resource that would otherwise simply be dumped. Hopefully we will never have to replace it because it won’t rot and should any component break, the company who made it will be able to make a new one: each house is built to order anyway. In addition, the people who made it appear to have added some sort of magic ingredient because yesterday, Mr Snail discovered Lorna sitting on one of the nest boxes, and when she stood up she revealed an egg. Her eggs are very distinctive and cannot be confused with eggs from any of the others. This is amazing, because the last time she laid an egg was June 2013. Having not produced anything for a year and being one of our oldest girls, we assumed that she had just run out, but clearly we were wrong. 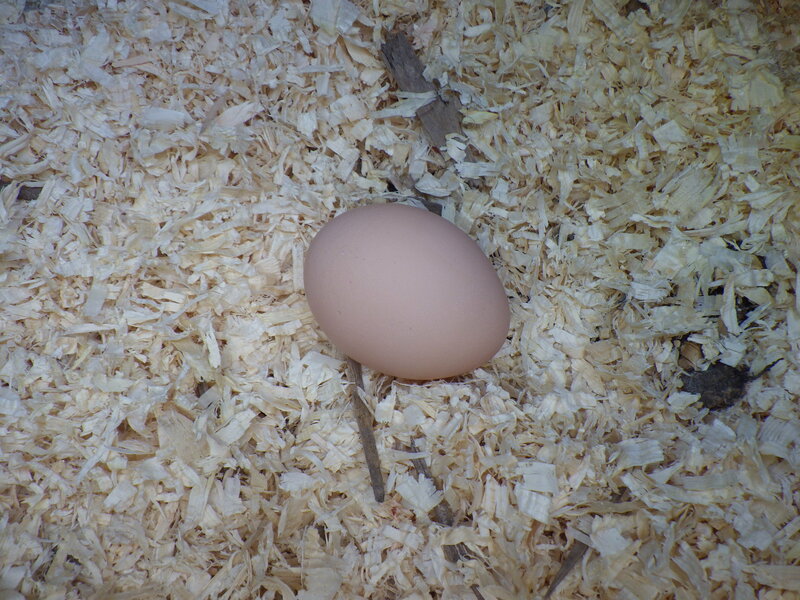 And just to prove that it wan’t a fluke – she has laid another one today! It was a very expensive way to get more eggs from her! My theory is that because the new house is black inside and has no window, her laying has been triggered by her experiencing a very distinct difference between day and night. The only other possible explanation I can think of is that I have recently started giving the girls a little of my homemade apple scrap vinegar in their water and it must be better than the commercial stuff, but I can’t believe that would trigger such a major effect. Either way, we’re happy and clearly Lorna is too! Very sleek looking accommodation. The girls must think they’re in a hotel. No complaints yet! And they get room service!!! I don’t know much about these things, but I’m gonna go out on a limb here and say that this is one cool hen house. Glad your chicks like it. I’m very pleased with it and the hens needed no enticing to use it! That is, without a doubt, the most stylish and practical hen house I have ever seen! It is just lovely! I am so glad that Lorna does too. A sweet post. I also think Mr SOH did a great job, especially with the landscaping. I did spend quite a long time choosing one… and even then I dithered about actually ordering it because it was quite an investment. It’s quite a relief that Lorna approves! When I first took in my cat Otto, as a stray, I built him a shelter in my greenhouse made from an old tea chest lined with polystyrene. He loved it. When he decided he wanted to stay here, I bought him a posh new shelter..and yes, you guessed it, he hardly ever goes in there! I think your “ladies” will be the talk of the neighbourhood with their eco-friendly, state of the art home, with all mod cons! I think it might be! It’s a major step up from the old house, which included black polythene and an old bath panel for a roof!!! It could also be that the hen house now appears to look a bit like an oven and Ms Lorna doesn’t want to become a chicken dinner? 😉 Seriously though it’s lovely and that area of mesh is a good idea. I would like to run little mesh chook runs all through our property but side from being prohibitively expensive, I am too lazy. Perhaps she’ll start laying lightly boiled eggs! And so easy to clean… always a big bonus.